Today is Holy Thursday or Maundy Thursday. I have some old posts about Maundy Thursday. In 2005, I wrote “Will you let someone you love die?” . 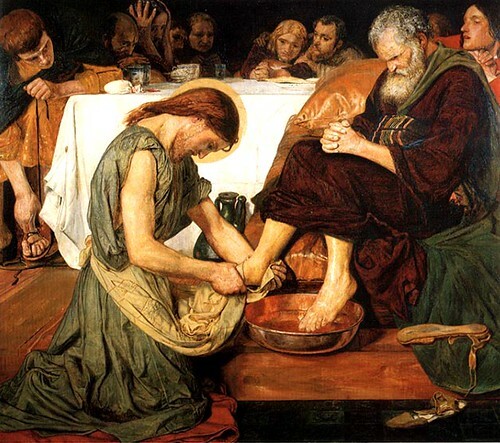 In 2006, I have another post on Maundy Thursday. I think my site was down during 2007 Maundy Thursday so I blog from my blogspot. The hypocrites and hypocrisies we lived with can blur our visions is one of those post that I am very proud of writing. I also have several good posts I wrote during this season of Lent. Well, looks like I had made it through the 40 days of Lent. Since Monday, I have attended Father Fabian’s very long, deep, sometimes confusing, sometimes full of enlightenment sermon. He has put them in pdf format and if you like you can read it from my church’s website. It is about conversion and salvation. I took it as a reminder from God that I should open my heart, my mind and my eyes and try to hear His messages and convey them. And when I proclaim, “I will make you the light of the nations so that my salvation may reach to the ends of the earth.” I have the convictions that each of us Christians have our roles to play and with the Lord, we will play it well. Maundy Thursday is one of the most significant day in my Christian life. It is a day when I am reminded the whole purpose we are here. That is to serve. That’s why you see the above painting of Jesus washing his disciples’ feet. Jesus wants us to serve and He will take care of the rest. Serving can come in many forms. I know I do serve a purpose and I think I have expressed that in my blog posts many times. Finally, the sermon ended with ‘How do I get there?’. Can you identify yourself with Zaccheus, the Samaritan woman at the well, the prodigal son or any of the ‘rotten’ guys from the Bible who received salvation despite of their shortcomings? Convert because you are saved; because salvation is yours. No matter what, God loves us and He loves us unconditionally. The agape kind of love. Remember, “You did not choose me, I choose you.” In other words, one cannot become a Christian even if one choose to, unless God choose them. Five years ago, God chose me. Previous Previous post: And we think our lives are hard…. Christ died so that we may live! Showers of His Blessings on Lilian and family and all her Christian readers and may we reflect Him in our lives, in all that we do! The little that we do to the least of our brothers, we do it to Him. There’s only 1 God who sent his only son to die for humankind because he doesn’t want us to perish in our sins. His name is Jehovah. He’s the alpha and the omega. God is great. Praise be to his name. May God have mercy upon us sinners. May we all have eternal life through Jesus Christ our Lord and Saviour. Praise the Lord all the earth! For His mercies endures forever! Christ came to die for sinners of which the chief i am. Dear ones whatever Christian denomination you are ,my question is “Are you born again, because Jesus told the learned man Nicodemus: Except a man be born of the Spirit and water one cannot enter the kingdom of GOD. (John chapter 3) And let me clarify , this is not the baptism parents do to thier children when one is born, or where one does a formal ceremony and gets a certificate, cause that is only a formal ceremony. But being born again is done by choice by a person acknowledging one is a sinner before GOD and asking GOD forgiveness and believing Jesus died for our sins and that Jesus is GOD’s own Son sent to save us. And then turning from thier sinful life to a Christ like life.! I accepted Christ in that manner many years ago and by GOD’s grace experienced the new life in Christ. He changed me forever and Christ guides me every day. Please “Are you born again”? Are you sure, read the Bible and ask Christ to come into your heart. Christ is a relationship foremost not religious rules and regulations. Religious rules is the law and Jesus came to set us free from the law. Some people follow a religion because they are born into that religion, but eventually each person needs to make a decision for Christ, not a Christian denomination, not the church, not to please parents but Christ first. Please forgive me if i sound like preaching but the wonders of being born of Christ Spirit is so precious and remember except a person be born again one cannot enter the kingdom of GOD. “Are you really sure you are born again”. May GOD bless each one of you. Ravi, yes I am. Praise be to God for his mercies are unending. Lilian, sorry for talking too much here. I’m not a Catholoc but I read about Lent which I think it’s a good thing. Hypocrites..they are everywhere. Handling one aint easy but I supposed that they are part of our lives. Its sad but thats pretty much reality..
selamat hari maundry thursday, good friday dan easter sunday! one thing i love about religion which takes me deeply into learning all of it is the fact that the Lord above would love us irregardless of how naughty we can be and has made life more meaningful. azhan – Selamat Hari Jadi to your Prophet Muhammad too. sue – Catholicsm is actually one of the easiest transition for a former Taoist like me. elegant coral – No, not at all. pablo & STP – Blessed Easter! Hello Lillian, I would like to wish you and your family a Happy and Holy Easter, and thank you for blogging about the election, that’s how I discovered your blog 2 weeks ago and since then have been a regular visitor. Thank you for sharing your convictions and baring your soul on faith and life. I came across your blog thru Rocky Bru and have been enjoying your coverage of the elections and also your thick-skinnedness. **sigh** YOU make me so nostalgic about my hometown and my old parish, Holy Spirit Church (now promoted to a Cathedral). Your reminiscing of Weld Quay brings back memories too, I used to wait under the overhead bridge to be picked up whenever I come home from KL by the overnight express bus, and observe the transformation of life from 6.15 to 7.15am, just like in My Fair Lady market scene where life starts with the dawn. I am also heartened by your steadfastness during this lent, I ran a good race too this time round, even though it could be better. After Easter, Boria time!!! Blessed Good Friday and a Holy Easter from an old Penang boy now in Dallas.